Spitfire Mk. VB BL628 made the headlines in the aviation press in last year, following its first flight after an epic restoration which took full 30 years to complete. BL628 was delivered from Castle Bromwich in January 1942. Allocated to No. 410 Squadron RCAF at Gravesend, it became a personal aircraft of G.B. Murray who named it Marion after his girlfriend. It subsequently served briefly with No. 308 Squadron 31st Fighter Group USAAF in Aug 1942, then Nos. 167 and 610 Squadrons. Transferred to Royal Navy in 1943, the aircraft was converted to hooked Spitfire configuration by Cunliffe Owen Aircraft in June 1943. Allocated to No. 899 Squadron FAA for training, it served in Belfast, Ireland. Before the end of the war, it went to 719 and 794 Squadrons Royal Navy at St.Merryn, but the airframe was now at the very end of its service life and the aircraft was eventually struck off charge and abandoned on a farm in St. Merryn, Cromwell. It is in the same place that the fuselage was found in derelict state some thirty years later. Acquired by Peter Croser & Michael Aitchison from Australia in 1977, it was initially rebuilt using components from various scrapyards in the UK. In the process, the aircraft went back to the UK in 1991 for a short period, then to Australia, where it received a new pair of wings built on Isle Of Wight, UK. More recently the aircraft was transferred to Avspecs Ltd in Auckland, New Zealand for final assembly. The first post-restoration flight took place on 29 September 2007. This DVD documentary provides insight into the final pre-first flight preparations and phase 1 of her test flight programme. The low-key commentary provided by Andy Hosking, one of the Avspecs engineers, provides good guidance to the intricacies of bringing a restored Spitfire in the air and explains o lot of technical detail. Andy’s commentary is one of the strong points of this video, providing first-hand knowledge of the Spitfire in general and the restoration of this airframe. The entire film proceeds in a rather leisurely pace, with static video sequences edited with long cuts. 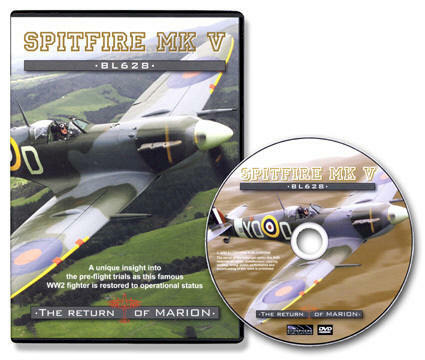 However, if you love the sight of the Spitfire, and especially the throaty sound of the Merlin engine, this DVD will be just for you. The sound recording, although sadly not in stereo, is of high quality, bringing a lovely sense of presence to all engine test sequences. Reproduced through a decent hi-fi sound system, all the roar and growl of the Merlin will sound glorious in your living room. And conveniently, the voice of the commentary can be turned off if desired through the setup menu of the DVD. Flight sequences show some impressive high-speed and display flying. Personally I would appreciate some air-to-air footage, but as far as I recall correctly none was arranged during the first phase of the flight tests in Auckland. The commentary ends with a farewell to this magnificent project. Although BL628 was the first Spitfire to be restored in New Zealand, the project crew was to enjoy the fruit of their work for only a few days. Immediately after the initial fight tests, the Spitfire was shipped to the US to its new owner, no doubt a sad occasion to everyone involved in its restoration. The film takes a total of 54 minutes. Additionally, the disc provides a photo gallery with over 200 photographs of the various details of the aircraft. Warmly recommended to true Spitfire fans and those interested in restoration of historic fighters.